Math Genius Socks | Featuring well-known functions in mathematics! Looking for unique, nerdy and interesting socks? These are a smart choice for you! 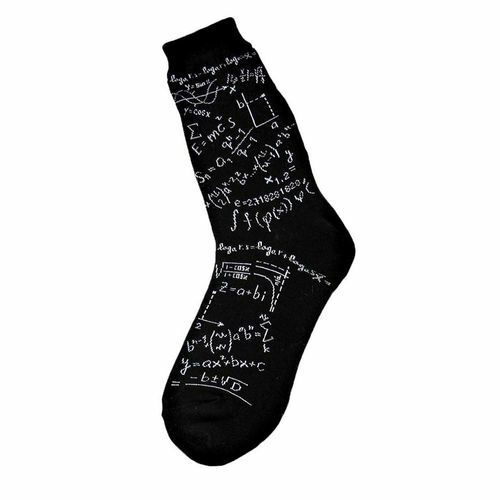 You're sure to love this awesome pair of Math Genius Socks as much as you loved calculus in college. You'll look and feel smart (without the need to cram before an exam), and you'll no longer need to count on your toes! Featuring a white chalkboard print on black socks, they are thin, lightweight and feature some of the most famous and well-known mathematical equations including Einstein's mass-energy equivalence and the quadratic function! Your inner nerd will love these fun socks! Made from 65% cotton, 15% nylon, 15% polyester, and 5% spandex. Machine wash warm, do not bleach.